Easy CSV Editor is one of the best editors for CSV and TSV data files you'll find on the market. In a clean and user-friendly interface, it offers simplicity and flexibility to edit both small and large documents. • Open, create, edit and save CSV & TSV documents even if they are not properly formatted, like don't have the same number of fields in each row! • Resizable rows and columns so you can easily see the whole content of the cells. • Set up to 6 rows as header rows. Choose if these header rows stay frozen or not. 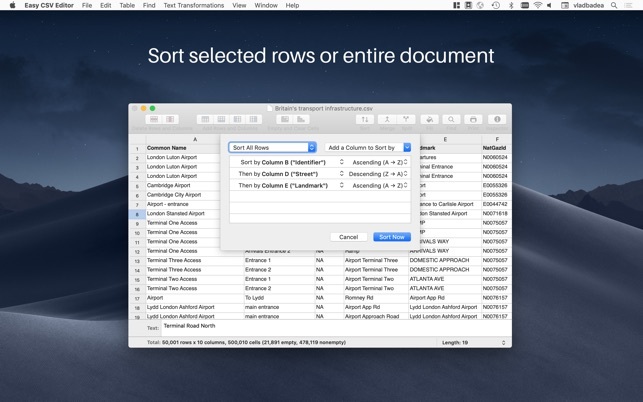 • Sort the entire document or a range of rows, based on multiple sorting rules. 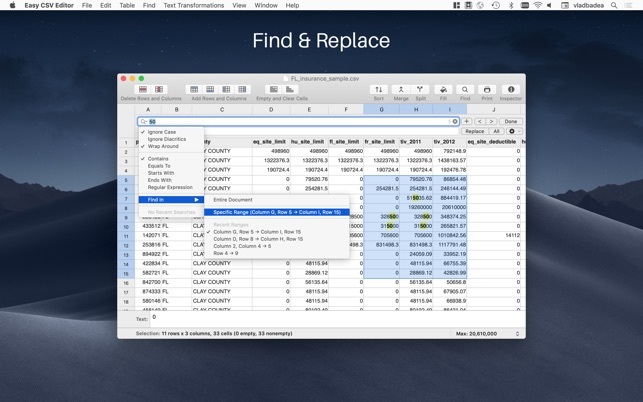 • Find duplicate (or unique) data from your documents. • Merge or split the selected cells or entire columns. 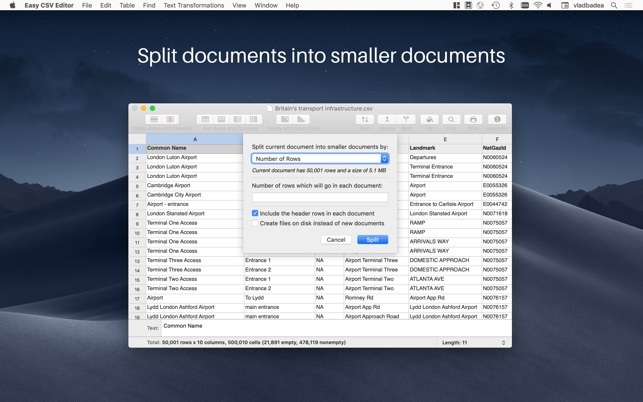 • Split documents by number of rows or document size. This is available from "File -> Split...". • Hide rows and columns. • Fill the selected cells using text of your choice. • Find and Replace text using a familiar, yet powerful, interface. • Find and Replace is supported in the entire document as well as in selected columns/rows/cells. • Find lets you configure where in the cells' text to look for matches: "Contains", "Equals To", "Starts With" and "Ends With". 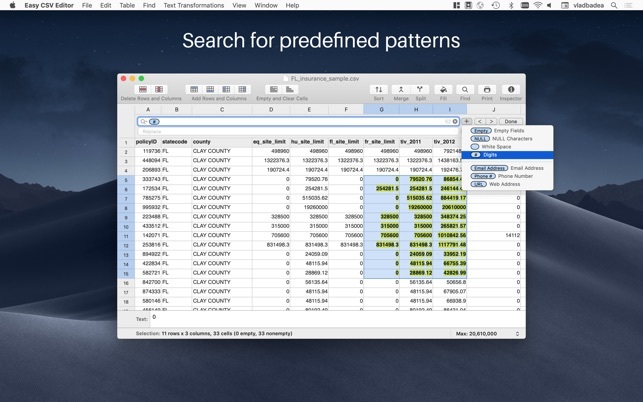 • Find also lets you search for special patterns, some of the supported ones being "empty cells/fields", "emails", "URLs", "phone numbers". • Use "Clear" menu item to "cut" the last fields from a row (or even entire rows!). This way you can produce beautiful documents, without the usual clutter produced by the in excess field separators. 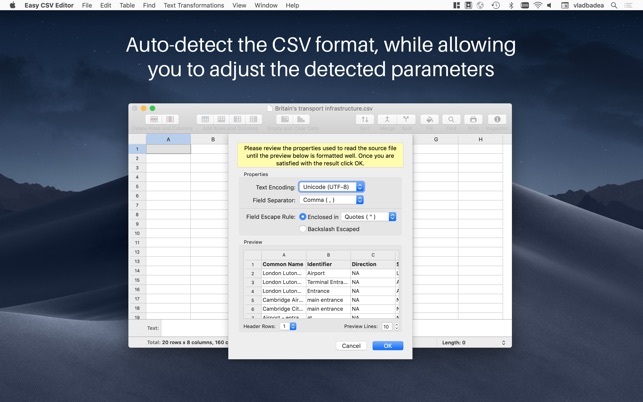 • Auto-detect CSV format, while providing you the option to adjust the detected parameters. • Copy, cut or clear a group of cells or entire rows or columns. • Full support for Undo & Redo. 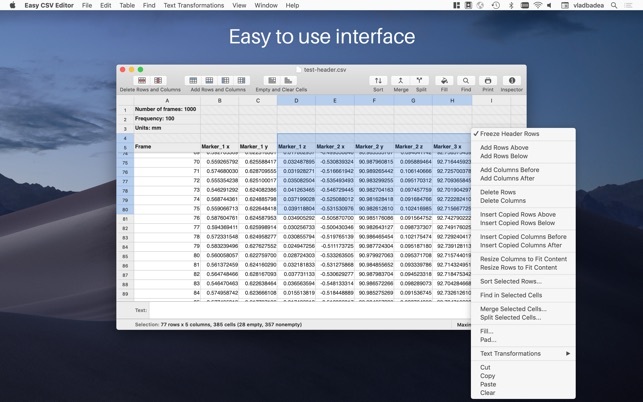 • Copy & Paste data between Easy CSV Editor and other applications (i.e. Excel, Numbers). Works the other way around, too! • Text transformations which allow you to cleanup and beautify your documents. • Customize the font used to display the CSV data. You can even increase or decrease the font size per document window (from "View" menu). These changes are persisted between application relaunches! • You can configure, from "Preferences" -> "General" tab, whether or not you want to be prompted for CSV input properties each time you open a file that has been opened before. If you choose to not be prompted then the application will use the last known properties for that file to open it. • Status bar at the bottom of the CSV window. On the left, it shows various statistics about the selection or document. On the right, it shows a calculation performed on the selected cells. You can choose one of the following calculations: Sum, Average, Min, Max, Count Numbers. • A big, resizable, text box located above the status bar showing the content of selected cell. You can edit the text in this box, too. Use Command + Enter shortcut to quickly put the focus in this box. • Customize the CSV properties when the document is saved. • Quickly visualize and change the properties of an opened document - just hit Command + I or "Inspector" button in the toolbar. • Drag & Move entire columns and rows. • Add rows or columns, via existing shortcuts or menu items, to the left/right/up/down of selection. • Insert copied rows/columns above or below the selection. • Quickly jump to a row (Command + L). • Quickly jump to the cells which are selected (Command + J). • Quickly move, via existing shortcuts or menu items, to document's left/right/top/bottom margin. • Preferences - among other things you can change the visibility of gridlines, column headers, footers and line numbers. • Print - among other things you can customize if the column headers and line numbers are printed or not. • Tabs support on macOS Sierra 10.12 and above - hit Command + T to create a new tab in the current window. • A long awaited feature makes its debut in this version. 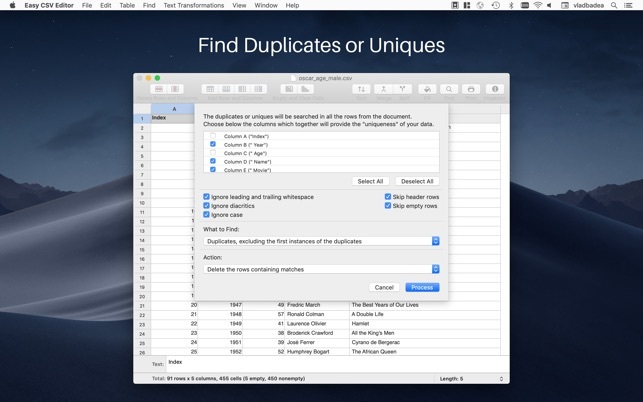 This is "Find Duplicates and Uniques" and, as its name implies, allows you to easily manage the duplicates (or unique data), from your documents. You can find it under "Table" menu or in the contextual menus. • "Find Duplicates and Uniques" works in the entire document as well as in the selected rows. You may choose which columns will provide the "uniqueness" of your data and may set various other options (i.e. "Ignore case" or "Ignore empty rows"). • You may choose an action to be applied to the rows which match the search criteria for "Find Duplicates and Uniques". The existing actions are: "Delete the rows containing matches" and "Select the rows containing matches". Based on the feedback received from you, I may add additional actions in the future. 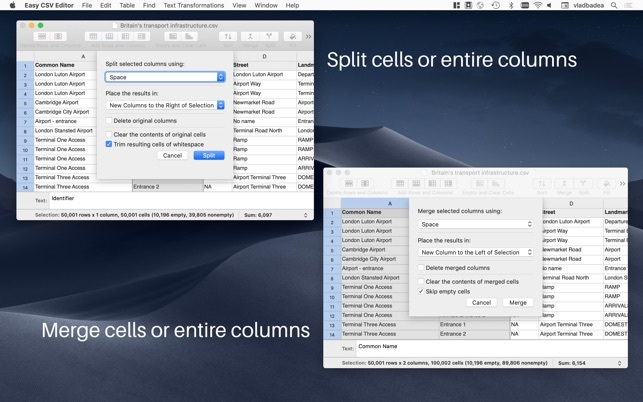 • Similar to Apple's Numbers, double-clicking the header for a column selects only the body cells in that column. 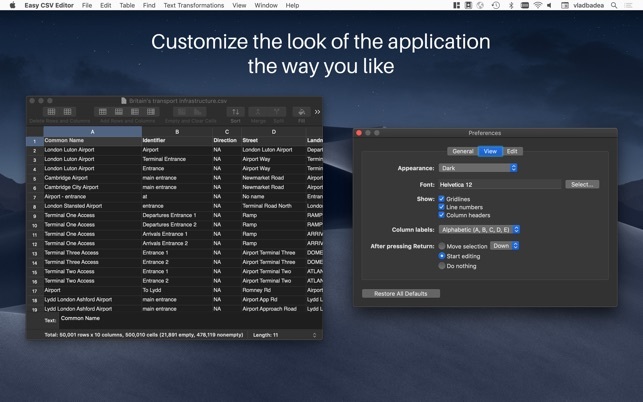 • You are now able to customize what happens when you "Zoom" a window. You may choose between "Default (Maximize Window)" and "Fit Window to Content". This setting is available in "Preferences" -> "View" tab -> "Zoom Behavior". • Fixes an issue where dragging the horizontal scroller, using the mouse, didn't work. • Fixes an issue where the sheet containing the CSV input properties would become detached from the document window. • Support for "header rows". • The "header rows" replace the headers being shown as part of the column header, and bring up some long awaited improvements: they can be selected, edited, searched, copied and all the other features which are available for regular fields. • You may choose up to six rows to be part of the "header rows". • The number of "header rows" can be configured when opening a file or afterwards from "Table" -> "Header Rows" menu. • The "header rows" may be set to be "frozen" (or not), from "Table" -> "Freeze Header Rows". • Support to scroll up the document (Page Up), scroll down the document (Page Down), scroll to the beginning of the document (Home or Fn-Up Arrow) and scroll to the end of the document (End or Fn-Down Arrow). • You can now duplicate the selected rows by using "Table" -> "Duplicate Rows" menu item (or Command + Shift + D) or the selected columns by using "Table" -> "Duplicate Columns" (or Command + Shift + C). Both of these commands are also available in the contextual menus when right clicking the row numbers or column labels. • Fixes an issue where pressing Option (Alt) + Left/Right, while editing a field, would create a new column to the left/right. • Fixes an issue where the buttons from the toolbar are disabled after opening a new or existing file. In some scenarios, the problem persisted even after selecting some rows or columns. This issue happened on macOS 10.12 and 10.13. Eine CSV-Datei hat eine andere Logik als eine Excel-Datei. Hier ist ein eigener CSV-Editor sehr praktisch. Der Easy CSV Editor unterstützt insbesondere das erstellen einer schlanken CSV-Datei in dem es den Button gibt, eine Zelle bis zum Zeilenende nicht nur zu leeren, sondern auch löscht, so dass in der CSV-Datei keine endlose Komma-Reihe erscheint. Auf dem Bildschirm erscheint dann eine Zelle mit einer schrägen schaffierten Fläche in grau-weiß. Ebenso lassen sich Leerzeilen als gelöscht kennzeichen, so dass am Bildschirm noch eine leere Zeile erscheint, aber in der CSV-Datei eine ununterbrochene Liste. So lässen sich bequem gewisse Felder verschieben oder aufräumen und die CSV-Datei bleibt immer im Standard. Das Programm unterstützt auch Registerkarten und ist fix gestartet. Optimal um schnell eine oder mehrer CSV-Dateien zu bearbeiten, anzuschauen oder zu durchsuchen. Über den Inspektor lassen sich auch die Einstellungen der CSV festlegen. Positiv ist der schnelle Support per E-Mail, den ich für eine Frage und einen Featurerequest erfolgreich genutzt habe. ocrho, thank you for your review! I'm also really happy you find the application (and its support) to be of good quality. Hatte vorher im Shop schon andere Apps zur Bearbeitung von CSV ausprobiert. Diese hier ist aber super: Läuft stabil, aich mit recht großen Dateien. Viele nützliche Funktionen. Klare Kaufempfehlung!! 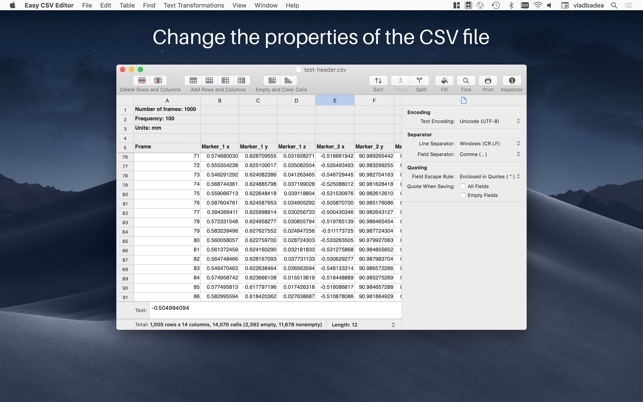 This is the fastest and most modern CSV tool for the Mac that I've tried. It works great. 1) The "use last known CSV options" setting is nice, but only works per file so I still get prompted all the time. I have a lot of files, and 99.9% of them can be opened with the default/autodetected settings. To achieve the goal of opening a CSV file fast, getting rid of the prompt would be great. "Table Tool" works a bit better in that regard. 2) Please make alignment of cell content consistent. I have a lot of columns that have mixed int/float values (e.g. "10.5" and "10" (not "10.0")). In this case, some cells in that column are right-aligned (int values), and some are left-aligned. This is almost as bad as Excel's "helpful" format detection (one of the reasons why I don't want to use Excel for CSV files). There are at least two options to improve this: a) left-align all cell values and don't do int autodetection; or b) add support to detect float values (difficult because you may have to detect which decimal separator is used? ), and right-align an *entire* column if and only if it contains only int and float values. Having a), at least as an option, would be a great start. jonas.witt, thank you for your review and feedback! Both items are already on my list and I have plans to tackle them in the near future. I will get back with an update to this review once they are done and available in the App Store version.